Powers/Abilities: Snowbird was a skilled hunter. History: Snowbird was an anti-fur trade activist/serial killer using her guise as a member of RCMP to slay trappers. She would sometimes skin her victims alive. She was eventually defeated by the hero Gay Guy. Comments: Created by John Byrne for his college newspaper The Emery Weal. Byrne would later re-use the name for one of the members of Alpha Flight. 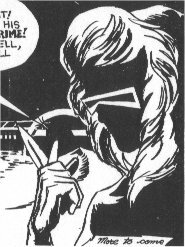 Thanks to Mike Murphy for informing me of this character - he also provided copies of her appearances, which you can see here.